The duck can be prepared in advance and re-roasted in a hot oven just before it is needed. Rub the duck legs with a little salt, star anise and ginger and fry in a pan for 5-10 minutes until brown. Enough fat should exude from the skin for them to fry in the pan. Add the fish sauce and sugar, coat the legs in the mixture, and reduce to a sticky glaze. Heat the oven to 200°C/gas mark 6 and roast the duck for 45 minutes before serving. If using duck confit, roast for 15 minutes. For the pickle, sprinkle the sliced or grated white radish with salt. Leave for 20 minutes, then squeeze out excess water. Mix together the remaining ingredients, then stir in the radish. Leave to macerate for as long as possible before using. For the soup, put the first six ingredients and half the bunch of spring onions in a pan, bring to the boil then simmer, covered, for about 30 minutes. Strain and discard the flavourings. 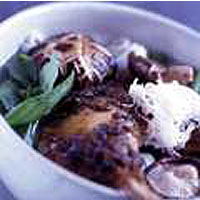 Reheat the flavoured stock with the shiitake mushrooms just before serving. To serve, put a mound of noodles in each bowl, add some chopped spring onions, celery leaves and/or herb leaves and pour over the hot stock. Divide the mushrooms between the bowls along with the roasted duck legs, some pink oyster mushrooms (if required), and serve with the pickled white radish. Eat with chopsticks, spoons and fingers.